Have you heard the term “end effectors” before? It comes from robotic automation – it’s defined as a device or tool that’s connected to the end of a robot arm where the hand would be. It is also the part of the device that interacts with the environment. The type of end effector dictates how it can interact with that situation. For our purposes, the end effectors are the “hands” of the arm or crane and can take many forms depending on the task. 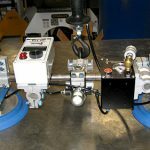 In manufacturing a mechanical arm can accommodate only certain tasks without changes to its end effector, so the selection of the proper end effector is the most crucial component of a lifting solution. Similarly, in cranes, the type of end effector is all important to handling the material safely and needs to be considered right from the beginning. While by no means an exhaustive list of the possibilities there are three types of end effectors in broad use today in industrial lifting situations. Typically you’ll see these versatile lifters moving large flat materials of considerable weight such as metal sheets or tractor hoods. 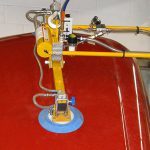 The vacuum lift is safe, easy to operate, and capable of moving heavy loads with fine precision. A vacuum lifter can also tilt or rotate your product, whether it is steel, aluminum, stainless steel, wood or glass. 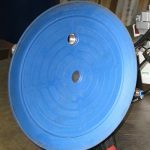 Now have you ever considered vacuum lifters for non-flat materials? Vacuum lifters can lift porous or non-porous materials and curved or irregular shaped materials such as luggage, feed bags, and fabric or paper covered loads in the form of a vacuum tube lifter. 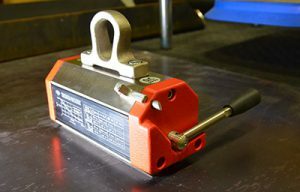 A vacuum tube lifter provides constant vacuum pressure and the reinforced tube is the lifting mechanism. The vacuum pad conforms to the irregular shape and material to provides “grab” to easily move lighter weight loads, such as a luggage, cement bags, or a feed bags. See a vacuum lifter in action lifting heavy concrete blocks. 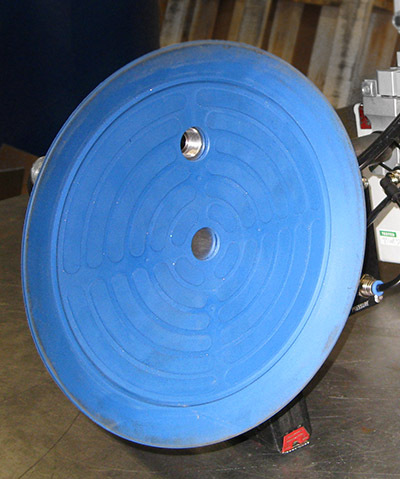 Vacuum lifter pads come in all different sizes for different lifting requirements. Lifting a tractor hood with a vacuum end effector as the grabbing mechanism. Vacuum lifters used on sheet metal. Is steel your thing? Magnet lifters provide a compact solution for moving large steel components such as sheet metal, agricultural or construction parts, machine dies, and hydraulic cylinders. 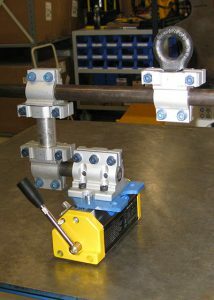 Basically, any time you have to move metal often, a magnet lifter should be the first end effector you would consider. The biggest benefit is that there are no slings to attach and preparation time for lifting is practically eliminated from the work flow. Used in parallel several magnet lifters can “grab” very large pieces of heavy or awkward sized metal. 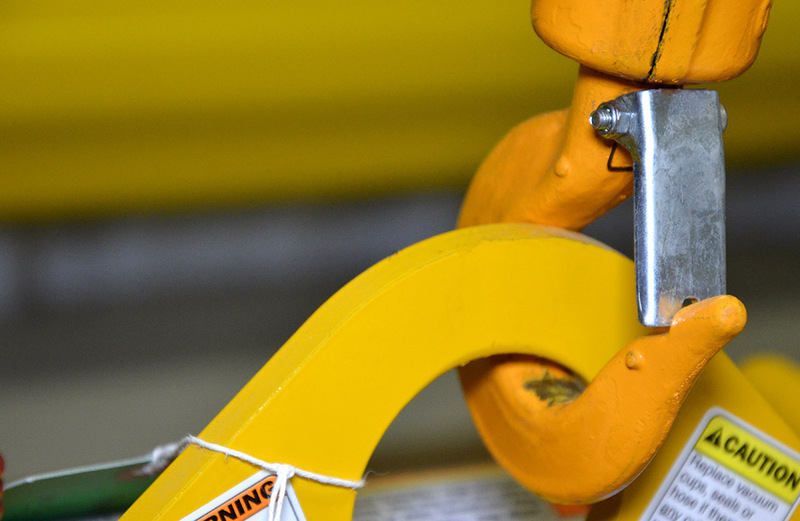 Clamps and hooks of all types can be attached to hoists and cranes to lift all manner of materials – for specific material or requirements – and are the most versatile of the end effectors. They are also needed to hold other end effectors so think of these as the wrists of the lifting arm. These can be quickly swapped and exchanged on the chain for different lifting requirements. While economical and versatile the downside is that they have a preparation time prior to lifting. Hook lifters are the simplest of all end effectors and are what most people think of when they think lifting. For added functionality, a two hook device is available that uses the upward motion of the chain to position the hooks on either side ensuring the load stays secure. The more upward motion and larger the load, the tighter these types of hooks become. Typically the load requires strapping or some other means of attachment which does require more preparation time of the load itself when using hook lifters. Our system designers can help you select the end effector best suited to your workflow that gives the lift you need. 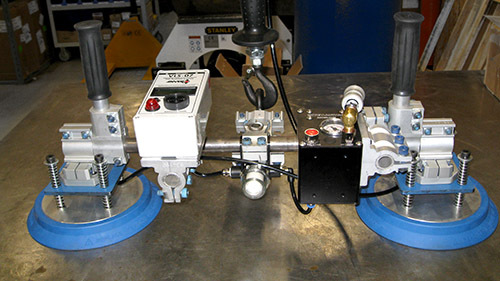 Contact us to see the different end effectors in action.